Continental Gold Inc.("Continental" or the "Company") is pleased to announce new high-grade channel sampling results from development cross-cuts and drifts from level 1B of the Yaraguá mine at the Company's 100% owned Buriticá project in Antioquia, Colombia. Following completion of the trial long-hole stope (see Company press release dated May 3, 2016), approximately 300 metres of new underground development measuring 3.5 metres X 3.5 metres on level 1B has been completed to date, which will allow the Company to begin additional mechanized mining in the Yaraguá vein system. 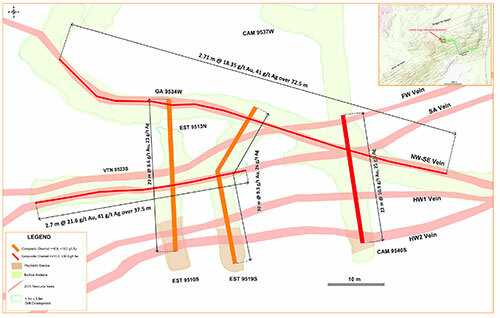 Assay results presented below have not only confirmed that vein orientation and geometries are as modelled in the current Feasibility Study ("FS") mine plan but have also outlined a significantly wider zone of high-grade precious metal mineralization that may be amenable to wider, more productive extraction than currently envisioned. Based on the Company's continued success in identifying broad areas of mineralization with underground development, which tend to be located proximal to contact zones between andesitic intrusions, sediments and breccias, a 3,000 metre underground drilling program has been planned for late Q3, 2016 targeting similar zones in the Yaraguá deposit. "Underground development sampling at Yaraguá continues to deliver high-grade results over significant true widths," commented Ari Sussman, CEO. "Combining these broad and high-grade channel sampling results with the excellent results encountered in our long-hole trial mining test stope announced on May 3, 2016 provides us with reason to be optimistic about the possibility of introducing wider, more productive extraction methods to certain areas within the FS mine plan. We look forward to completing environmental permitting later this year and commencing project financing and development shortly thereafter." Continental's 100%-owned, 61,784-hectare project, Buriticá, contains several known areas of high-grade gold and silver mineralization, of base metal carbonate-style ("Stage I") variably overprinted by texturally and chemically distinctive high-grade ("Stage II") mineralization. The two most extensively explored of these areas (the Yaraguá and Veta Sur systems) are central to this land package. The Yaraguá system has been drill-outlined along 1,100 metres of strike and 1,700 vertical metres and partially sampled in underground developments. The Veta Sur system has been drill-outlined along 1,000+ metres of strike and 1,800 vertical metres and has been partially sampled in underground developments. Both systems are characterized by multiple, steeply-dipping veins and broader, more disseminated mineralization and both remain open at depth and along strike, at high grades. Rock samples have been prepared and analyzed at Continental Gold's Yaraguá mine laboratory at Buriticá, Colombia. Blanks, duplicates and certified reference standards are inserted into the sample stream to monitor laboratory performance. Crush rejects and pulps are kept and stored in a secured storage facility for future assay verification. Although historic correlation between analytical results from the Company's internal laboratory and certified independent laboratories for gold and silver analysis have been within acceptable limits, the Company's internal laboratory is not independent or certified under NI 43-101 guidelines and as such, results in this release should only be taken by the reader as indicative of future potential.